In Ancient Egyptian anthropology, the "ab" ("ib" or "heart") was caught in the "net" of the "khat" (physical body). The word "ib", written with as , or as a single hieroglyph representing a (mammal) heart + the determinative for "one" (a stroke), generally meant : middle, interior, intelligence, thought, attentions, intentions, disposition, will, wish, mind, ego. The heart is the state, quality or "mental" condition which the Egyptians associated with the physical heart. This was a product of maternal education. The word "Hat" meant a member, the flesh of the physical body, the person in bodily form, a product of Earth. Contrary to the physical body and the "Ka" or "double", the heart represented a state of consciousness rather than a vehicle or executive component of man. Its conservation was deemed necessary for the general mastery situated in the heart, responsible for the direction of the rudder, the navigation on the river of life. The heart also covered the main characteristics of what today is called "ego-consciousness", namely intention, mind, will & ego, associated with cognitive capacity, speech and the power of the word directed towards "body & belly". Many centuries later, depth-psychology described the coordinating influence of this personalized center of consciousness. The "ab" appears as the place of awareness, coordination and mental control (the mind). The "ab" is the seat of the will and hence responsible for a person's evil deeds, which cause the heart to become heavy and dull (for everything said & done is recorded). In a good will, the heart steers the concert of physical, vital and emotional (imaginal) forces at work in the common human being well, and remains ever as light as a feather : flexible, strong but of nearly no weight (i.e. in accordance with Maat). In a sick heart, coordination is lost and so consciousness has no strong focal point. The will is weak and one's expectations are spoiled by fear (cf. the Discourse of a Man with his Ba). In the Book of the Dead, the heart appears in the context of being without blame (i.e. in harmony with Maat). The deceased did not wish to loose his or her heart after judgment, for it was the seat of the "Ba". Judgment came after the mummy had been reactivated and adapted to its new (subtle) environment (cf. hylic pluralism) and it was decisive in order to enter heaven to have passed the trial of the balance in the Hall of the Double Truth. A heart found to be heavier than the Feather of Maat was devoured and with it the prospect of eternal life. Hence, the heart was also a "moral" center (cf. "conscience" or "super-ego" in depth-psychology). During life, the heart was closely related to the "Ka". All Egyptian words in the Maxims followed by the determinative for "heart" are listed here. In the text, the word "heart" is always used to indicate and/or express subjective, internal, intimate, "states" or "conditions" of consciousness. In the context of the teachings, Ptahhotep summarized the phenomenology of the subjective, insofar as Maat is concerned and is used as a good example of her functioning. The awareness of each human of him or herself, of volitions, affections and cogitations, and the complex functions, organs, subdivisions and strata of the psyche and her implicate processes are part of the connotative semantic field of the word "heart" and its use. The fact that so many "states" are mentioned, is suggestive of the freedom enjoyed by the "heart" to turn to any side it desires. This implies that with the "heart", we touch upon Ancient Egypt's concept of "will" and "freedom". As we shall see, ante-rational philosophy did conceptualize "free will", implying that our precious philosophy of freedom was initiated before Augustine's "free movement of the soul" (so necessary in Christian morality - cf. my Against the Free Will). Moreover, to the ancients, a harmony existed which was established with the act of creation itself (a theme returning in the monadology of Leibniz). In Maat, freedom (the "ought") and the necessities of good order (the "is") were reconciled (and not identified, as Marxists, with their prejudicial views on antiquity, would like to read it). As always, the Egyptian language of the Maxims captures the essence of the "state of heart" in a pictoral, metaphorical and poetical way, leaving room for many readings and an alternative "coupure" of the text. Instead of trying to give a good description, my translations mostly try to remain near the phraseology of the extant original. To understand an Egyptian concept one is advised to seek context before content. The latter may be isolated within a given set of connotative meanings, but is never defined beforehand as in the "geometrical" method developed by the Greeks (cf. Euclid). In Ancient Egypt, "philosophy" was not a profession, nor a trade (as it would be in the Greece of the Sophists). Hence, there is no word for "philosopher" (the lovers of wisdom, "sofia"). Wisdom was regarded as something some people grew into. As nobody was born wise, we see wisdom appear, in the so-called "didactical literature" of the instructions, as an exponent of the process of acquiring a just perspective on life, i.e. the time of "follow-the-heart". Rectitude led to the state of veneration as a "noble dead" in the "Beautiful West", the hereafter. One survived without being immortalized. Only Pharaoh took the next step, namely that of a deification beyond the limitations of wisdom (the canon of Maat), and this by being a god (like Maat) and the sole mediator of order, justice & truth (without Pharaoh, the only god on earth, justice could not be offered to the creator -gods only conversed with gods- causing the righteous order to collapse). Pharaoh, contrary to Maat, existed before creation, and so participated in the first time (as did the magician) ! When he died, he rose up as a dreaded god to the Imperishable Stars. Indeed, wisdom was the best a non-royal aristocrat or a common intellectual (priest, scribe) could hope for. In the instructions, we can see it at work as the law of existence itself. Insofar as we relate philosophy to the overall metaphysical question of the nature of the universe and humankind, Ancient Egyptian literature reveals itself to be a fertile ground. Besides the explicit presence of wisdom in moral teachings such as our Maxims, we find philosophical strands, elements & perspectives in creation-texts, resurrection-texts, songs of praise (hymns), funerary spells, tales, poetry, literature of despair & ante-scientifical texts (medical, astronomical & mathematical papyri). 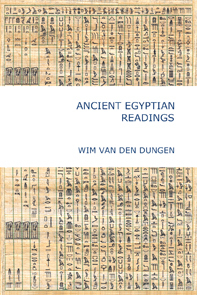 These considerations are always intermingled with the context at hand, but as soon as a broad comparative horizon emerges, one can not deny that the Ancient Egyptians had a philosophical inclination, albeit in an ante-rational format. That this "wisdom" was not the result of a free rational dialogue should trigger our interest to find out the silhouette of the Ancient Egyptian sage. He is not a disputant, but one who listens and acts out truth and justice. In the Maxims, wisdom is intimately linked with the process of transference of a wholesome tradition to posterity by way of patronizing speech (between father/son, master/disciple, teacher/pupil). 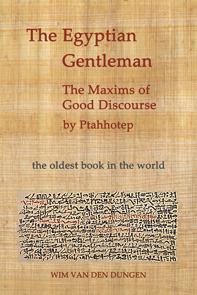 This "didiactical" intent is not realized by means of a theoretical description (unavailable in Ancient Egypt), but solely through the use of the "good example", both in the sense of a "beautifiul discourse" (of the teacher) as well as "good actions" (of one's noble ancestors). Just as the great is known by his good actions, the knower is known by his wisdom. So, wisdom is the resplendence of knowledge, the surplus acquired after the long and fertile impregnation of the soil of knowledge, with the "food" of the rejuvenating "waters", which often inundated it. Good examples are vignettes of the living truth of Maat. The maxims are such drawings of exemplaric situations, conveying their benefits "de opere operato" to the son who hears. The knower of truth, who is not ignorant nor foolish, feeds his inner soul (Ba) with what endures (goodness, beauty, perfection, accomplishment). Thus the knower makes his own soul happy on earth (the wise are not sad). Wisdom is hence more than knowledge without falling outside the realm of knowledge. It is the awareness of the one who knows to think, speak and act in accordance with truth & justice. In that sense, wisdom is the conscience of knowledge, the value of the known for the sake of the inner being of the knower and his context and not for the sake of knowledge (the latter is a theoretical persuit and hence lies outside the scope of ante-rational speculative thought). In my reading of Ptahhotep's text, the distinction between "hearing" and "listening" is pertinent (see 3.1). The knower "hears" and may become a "master-hearer". This "expert" (or craftsman-hearer) is not necessarily somebody who has grasped the real, inner meaning of the words. He is like an artisan, but not yet an artist ... He follows the examples literally and is not able to discern the same law of rectitude at work in each one of them. Proto-rationality approaches abstraction by multiplying relevant, contextualized examples in the hope that the "file rouge" is discovered (but not expressed, for the logical principle of Maat is never defined as such). The listener is one who understands this. In every situation he witnesses Maat in action. Wisdom is erected upon this understanding : the good examples are to be "heard" well and properly "understood". The canon of this understanding is the double law of rectitude : human versus divine (macrocosmic), but also belly versus heart (microcosmic) and Upper versus Lower Egypt (political). The wise upholds the truth and so grasps the "meaning" behind the words, the "vital energy" (Ka) behind the material form, the inner being behind the outer manifestations. This is the "mystery" of wisdom so guarded by antiquity ... Because the wise wants to be happy on earth, he invests in what is enduring for his soul, namely doing Maat and perform great deeds in her name. He prefers silence to chatter, and speaks the good discourse. Clearly the Egyptian sage is an intellectual and a thinker, but always within the form of the balance of truth and the judgment of the assessors. The time of "follow-the-heart" is not the liberation of thought out of the contextualities of city-states and the discovery of a Protagorian exclusivity (cf. the Greece of Protagoras), but the fulfillment of what exists, the "act of Maat", namely order, truth & justice. So the wise is always a "priest of Maat", a judge administering the living truth by the grace of his king, lord and god-man, Pharaoh, the archetypal teacher. But, both as a laconical observer of people's errors and their consequences as well as a good example to be followed by others, the Egyptian sage surpassed the contextuality of Egypt itself and then his wisdom was indeed for all ages. (021) a 'Staff of Old Age' : usually taken as a metaphor for a son or a successor - in the context of an instruction, the latter seems indeed more to the point, although in Ancient Egypt, knowledge was primarily transmitted from father to son. Wisdom too ? Only as late as the New Kingdom did the instructions become "middle class". The setting of the Maxims is therefore aristocratic. The command is given by Pharaoh and executed by his servant, the vizier Ptahhotep. The "staff" may also refer to the teaching itself, the good discourse which is about to start. When old age has arrived, wisdom is what keeps one upright. Wisdom is the comforter, the aid, the "third" leg. The determinative is a man leaning on a stick (A19), which also occurs in words like "old", "eldest", "great one", "chief", "lean", "support oneself". Wisdom is the youth of old age. Wisdom is the command of elders and the proof of a true & just life. (033) no one is born wise : wisdom is acquired, not given. At least three stages are given : the master-hearer, the master of what is good and the state of veneration. 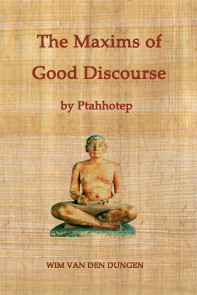 (034) the maxims of good discourse : this also means : beautiful, accomplished, perfect discourse. To speak well is more than convincing an audience (cf. Greek rhetorics) : it is the manifestation (or transformation) of balanced thought as (into) sound. This "balance" is nothing less that truth & justice (Maat) and hence good discourse inspires respect, awe and admiration. Moreover, it is authoritative speech ("Hw") which bring into material manifestation that which it vocalizes. (404) the good deed profits the son-of-man : the "son-of-man" is the "wellborn", i.e. of goods stock (in Aramaic & Hebrew the same connotation prevails). This wellborn is advised to do good deeds. The lesson being that goodness can be multiplied and fructified. If nobody is greedy, understands that belongings are relative & temporal and so shares with his neighbor, a larger good will be attained (cf. Jesus more than two millenia later). (426) a master-hearer : before wisdom emerges, the pupil must be able to entirely concentrate on the teaching. He then works on what he heard like the artisan his artefact. The master-hearer heard his father speak to his posterity. (431) wisdom will be for all time : the examples of wisdom are perennial and endure as long as existence lasts. (537) the venerated place : in the afterlife, the "noble death" reached the heaven of Osiris without being deified (as was Pharaoh, the god-man). Ancient Egyptian theology did not adhere to a radical monotheism, neither to a disorganized polytheism. During its long history, it moved from a loose henotheism (with several, national "godheads" like Atum-Re, Ptah, Thoth & Osiris) to a strict henotheism (cf. Amun-Re in the New Kingdom). It never relinquished the pantheon, nor the sacred pictography of the "divine words". In this early phase, Pharaoh's role was fundamental. Because he, as a god-man, was the only possible mediator between the sky (of the pantheon) and the earth (of Egypt and its temples), he guaranteed the stability & the unity of the world by offering truth & justice (Maat) to his father Re. With the end of the pyramid age came the First Intermediate, a period characterized by an increased provincial, family-based individualism. The Middle Kingdom which followed, democratized ascension (everbody had a soul and was an Osiris NN), but also familiarized judgment (a soul could be annihilated). Amun-Re of Thebes became the national god, and with his worship a strict henotheism was born. At first these theologians placed Amun at the apex of the pantheon as "king of the gods" and "divine judge". In the New Kingdom (especially after Amarna), the Thebans intellectual elite understood the complete pantheon as so many manifestations, transformations, theophanies of the "great" and "one" Amun, hidden by nature but manifest in nature's millions of forms (cf. Amun). A sacerdotal theocracy was born. Although Amun listened to the prayers of the commoners (a novelty), everything was in his hands. After the New Kingdom, Egyptian theology no longer evolved, perhaps even regressed. In the Late Period (especially under the Ptolemaic empire), the influence of Hellenism became predominant. The confrontation between Greece & Egypt led to syncretism (Serapis), esotericism (of the native religion, focusing on Osiris & Amun-Re) and the explosion of the signary (only ca.15% of the 6000 attested hieroglyphs were in use before the Graeco-Roman period). Taking into account the influence of Judaism, both Hellenistic (with its Septuagint, the Greek version of the Torah or Pentateuch, the first five books of the Old Testament) as "traditional" (cf. the various Jewish desert sects, such as the Qumran-people, the Essenes) as well as the amalgam of cultural influx reaching Alexandria from the East (cf. Chaldeans, Fakirs, Buddhists), we may understand why it is very likely that Egyptian theology reached its ultimate, native expression in the late New Kingdom (cf. the Rammeside period). The synthesis achieved by Alexandrian Hermetism (cf. the Tabula Smaragdina & the Corpus Hermeticum) depended largely on Greek philosophy intermingled with traditional elements drawn from Ancient Egyptian, Hebrew and Greek sources. It is this formidable synthesis "of Hermes" which also influenced the subsequent formation of Jewish qabalah (cf. Sepher Yetzirah) and which was first assimilated by Christian and later by Muslim traditions (cf. the Corpus Dionysiacum and the integration of the Moon-religion of Harran in Islam). During more than two thousand years, an aura of mystery and awe surrounded this "Orientale Lumen" (cf. the influence of Hermetism on the storehouse of images of Freemasonery, Theosophy and the New Age). Qua contents (less perhaps qua form), these teachings were however firmly rooted in Ancient Egyptian theology. In the Maxims, the divine order appears in number of ways. Foremost, the divine nature of Pharaoh is put into evidence. He is addressed as "majesty" and "this god", but as the apex of Ancient Egyptian society, he is simply called "god" whenever he or his representatives (the temples & administrators) are implied. Indeed, the Pharaonic State is divine because it is the emanation of Pharaoh's majesty (power) and divinity (justified rule). In all other cases, it is likely that the word "god" is used as a reference to the god of Memphis, Ptah. In a few cases, both satisfy the context, and we remain in doubt. The plural "gods" is used only once, and together with "they" and "theirs", is suggestive of the pantheon as a whole. Only three deities are invoked by their proper name : Osiris, but not actively but only as a metaphor of eternity, Horus (the old sky god is mentioned in an epithet) and Maat. The latter goddess appears often and receives (as Pharaoh) individual attention and activities. (536) doing Maat : living truth & justice as Pharaoh's servant.